MUTA Menu Show search box. 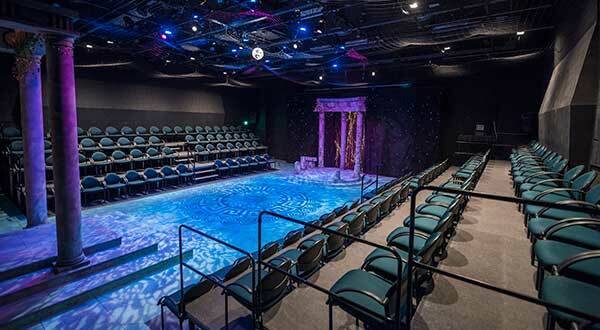 Shows rehearse and perform in three theatres equipped with advanced lighting and sound equipment. The Performing Arts Center houses fully equipped scene and costume shops, a small dance/rehearsal studio, make-up and dressing rooms, a script library, a music library, practice rooms equipped with pianos, recording facilities, an extensive costume collection, and a computer lab. 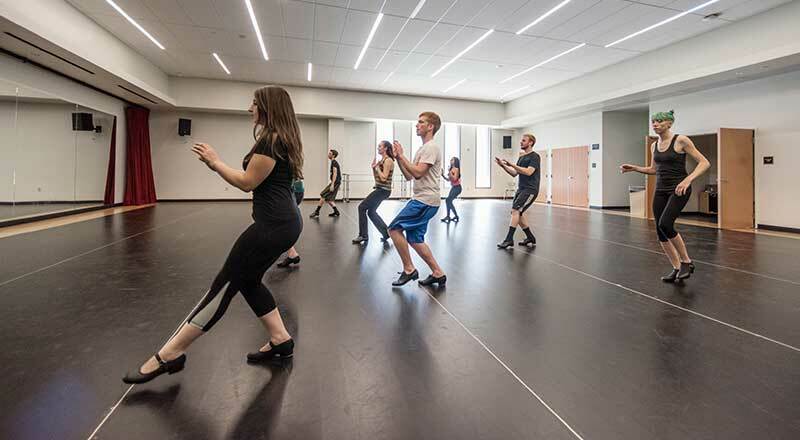 A large dance/rehearsal studio is available to the theatre department in Acker Gymnasium. Laxson Auditorium was completed in the early 1930s and it has been renovated with state of the art lighting, sound, and counterweight systems. The theatre is the main "Road House" in the Chico area. The auditorium seats 1200 in an American seating style with a large balcony. The traditional elliptical proscenium arch is more than 25 feet high and 36 feet wide. The stage is 30 feet deep with a medium sized orchestra pit. The Theatre Arts Department produces its spring musical in Laxson Auditorium. Many theatre students gain valuable experience as stage hands for the many events which are produced in Laxson. The Harlen Adams Theatre is the largest of the three performance spaces in the Performing Arts Center. The continental auditorium plan seats about 450. The stage is forty feet wide with ample wing space and a spacious apron that can be raised and lowered to create various stage levels or a large orchestra pit. The Adams Theatre also boasts an advanced computer lighting board, excellent sound recording and playback capabilities, a fully trapped stage floor and a full fly house with newly renovated counterweight system and rigging. The theatre stage has direct access to the shop area. The Wismer Theatre is our “Black Box” space. It is equipped with flexible seating that can create full or three-quarter arena stage configurations as well as thrust and traverse configurations. The control booth is equipped with an advanced computer lighting board and excellent sound playback and recording capabilities. 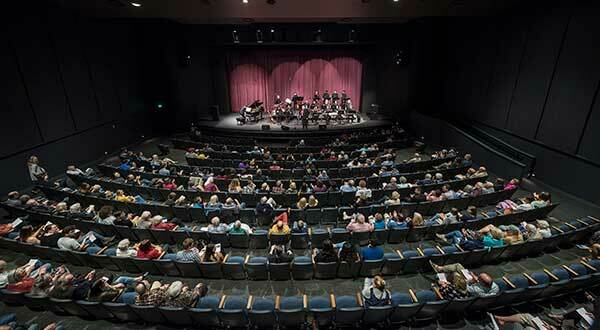 Harlen Adams Theatre is the principle performing venue of the CSU, Chico School of the Arts, presenting cultural offerings in music, dance and theater. 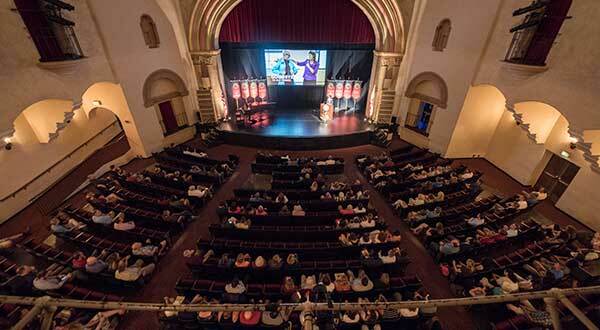 Hosting a multitude of performances annually including student recitals, Harlen Adams Theatre is a fully equipped venue with a seating capacity of 486. The beautiful 196-seat Zingg Recital Hall suite features variable acoustics in an intimate natural wood environment. Named for the founder of the Recording Arts program at Chico State the Barker studio is equipped with some of the finest recording equipment available. 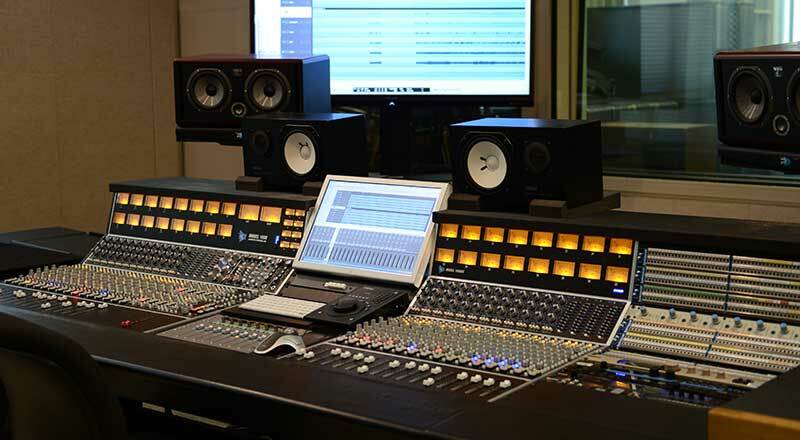 The centerpiece of the control room is API recording console with ATC, Focal, JBL, and Yamaha monitoring. The live room houses a Steinway piano, Yamaha custom drums, Fender and Vox amps, and one of the best microphone collections in Northern California. Housed inside of the beautiful new Arts & Humanities building Recording Arts students have access to the best of analogue and digital technologies in our studios featuring product lines that run the gamut of industry standards including SSL, Augsburger, Adam, ATC, Neve, Manley, Massenburg, Teletronics, Universal Audio, Logic, Pro Tools and Radar. 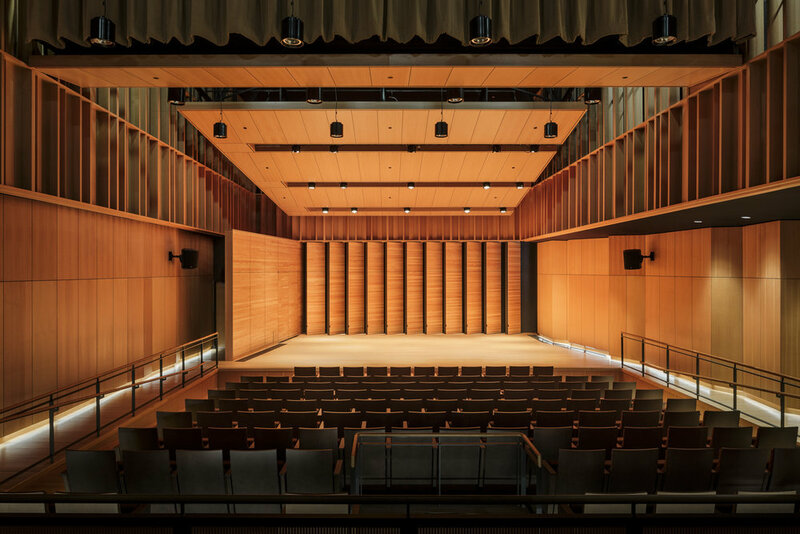 Students gain transferable knowledge and potential for unlimited creative synergies utilizing an equally comprehensive state-of-the-art microphone collection and the audio/video interconnected Zingg Recital Hall as well as additional recording spaces and venues. The Recording Arts Electronic Music Studio is an analog and MIDI composition, editing, sound design, and 5.1 mixing suite which houses an array of hardware and software from Apple, Avid, Korg, Kurzweil, Native Instruments, ROLI, Waves, and more. Built for our diverse projects in music and media the Electronic Music Studio is used by all Recording Arts students. These are our larger dance/rehearsal studio spaces, housed across the campus in the athletics building and in the new Humanities and Arts Building. The studio is a huge, open space, well fitted with ballet barres, a wall of mirrors, flexible seating arrangements and set/prop storage, which allow for classroom use as well as workshop productions. The space is where our dance technique, choreography, and dance production classes are taught as well as many of our acting classes. We also use this versatile space in the evenings for rehearsals of many of our productions, including Chico Dance Theatre and the big spring musical. The Theatre Arts Department has a full scale scene shop with painting and welding facilities and a large construction area that is directly connected to the Harlen Adams Theatre. The Theatre Arts Department's costume shop is fully equipped with separate cutting, dying, washing/drying, ironing, sewing/serging, and hand stitching areas. There are also separate fitting and storage areas available. The lower level of the Performing Arts Center, in addition to the small dance/rehearsal studio, contains ample storage space for sets, props and lighting equipment plus a large make-up studio and women’s and men’s dressing rooms. 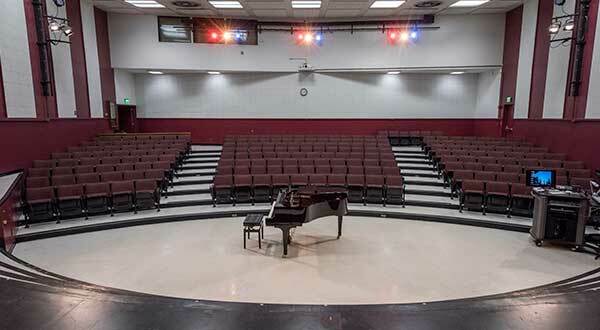 The Band Rehearsal Hall is located at PAC 132 on the Chico State campus.